PDM is Siemens’ Windows-based HART configuration tool. My copy of PDM is a single point license that I use with a HART modem to configure field instruments using the “Lifelist” quick start app. When I recently changed from Windows XP to Windows 7, the LifeList app would launch but the upload/download buttons were greyed out and it wouldn’t even attempt HART communication to field instruments. Grrrrr, what to do? I discovered two check boxes in the compatability tab of LifeList’s properties that when checked allowed PDM’s Lifelist to run and communicate. and clicked the OK button at the bottom. Then LifeList launched and now runs HART communications like it did on XP. 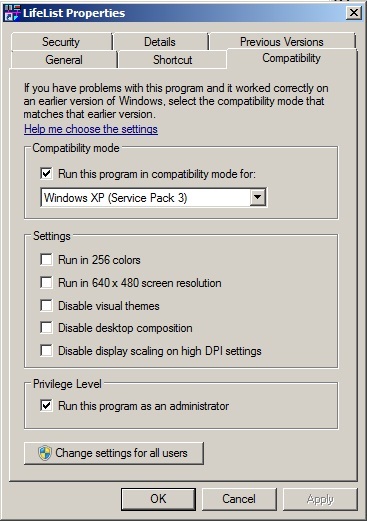 If you have other programs that run under Windows XP, but stall in Win 7, give this approach a try. This entry was posted on August 18, 2011, 4:23 pm and is filed under Communications, Configuration, HART, Siemens, SIMATIC PDM, Transmitters. You can follow any responses to this entry through RSS 2.0. You can leave a response, or trackback from your own site.